Hello! I just wanted to quickly thank you and your entire staff for a wonderful vacation! We always wanted to go to Lake Tahoe and we finally busted the move this past holiday season. Before we booked our vacation, we seriously thought about staying at a hotel. At the last minute, we decided that staying in a condominium would be better since we wanted to make our own meals – especially dinner. Plus, the kids really like to play catch and explore, so being able to open the door and step outside was much more appealing than the idea of taking an elevator up and down all day. Also, while my husband and I do enjoy a little gambling here and there, it looks as though the only hotel in the area was also a casino. I’m sure it would have been fine, but we were a bit hesitant on how family-friendly that place truly was. At any rate, I don’t want to bore you all, I just wanted to extend our thanks. The condominium was so clean and spacious, it truly exceeded our expectations. Having all the comforts of home – a nice kitchen, living room with a flat screen TV, and multiple bathrooms – is the way to go while on vacation. The fact that we could walk to the shopping center and several really good restaurants was added bonus. The entire family is extremely jealous of all you lucky people who get to live in such a beautiful, peaceful alpine location year-round. I will think of Tahoe often as I stare out my downtown office window at the honking cars and smog below. Thanks so much again and see you this summer! It is reported to be the driest December in the past 100 years for the Lake Tahoe area. With no precipitation in more than a month and none expected for at least another week, winter outdoor enthusiasts and state water officials are far from dancing with joy. Yet, despite the lack of enthusiasm – and snow – maybe that’s exactly what’s needed. 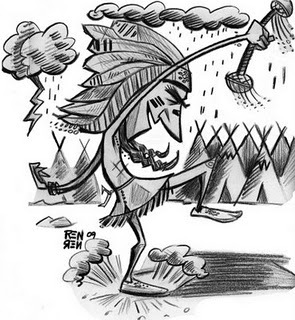 The rain dance has been performed by Native American tribes for centuries. While most people these days feel it’s meaningless, fun pomp and circumstance, there are others who still strongly feel these ceremonies help ensure the stormy weather will return soon. 1) Wear turquoise and feathers if possible. Turquoise represents rain and feathers the wind in many Native American tribes. 2) Find an open, flat, outdoor space that allows you to move around freely and has a clear view of the sky above. 3) Spin around in slow clockwise circles. 4) Start Chanting. Any pro-rain, storm, snow dialogue will suffice (i.e. “Let it snow! Let it snow! Let it snow!”). Repeat chant over and over. 5) Raise your arms up to the sky as you chant and spin. 6) Close eyes and take deep breaths. 7) Speed up spinning and chanting. 8) End rain dance by dropping to your knees. 9) Remain on knees in silence. With no snow on the ground and the weather forecast calling for sunny skies through the first part of January, it’s time steps were taken to help turn things around. While it may seem ludicrous, those steps could be in the form of a traditional rain dance. Sure, the neighbors may think the record-setting dry conditions have gone to your head as you chant and spin away in the backyard, but when it starts snowing again, everyone will be dancing with joy. With daily lift tickets approaching $100 at many resorts across the country, skiing is becoming quite an expensive venture these days. Like successfully navigating the moguls of a black diamond run, finding affordable places to hit the slopes is proving very difficult. Thankfully, the north shore of Lake Tahoe has a few diamonds in the rough when it comes to inexpensive ski lift tickets. 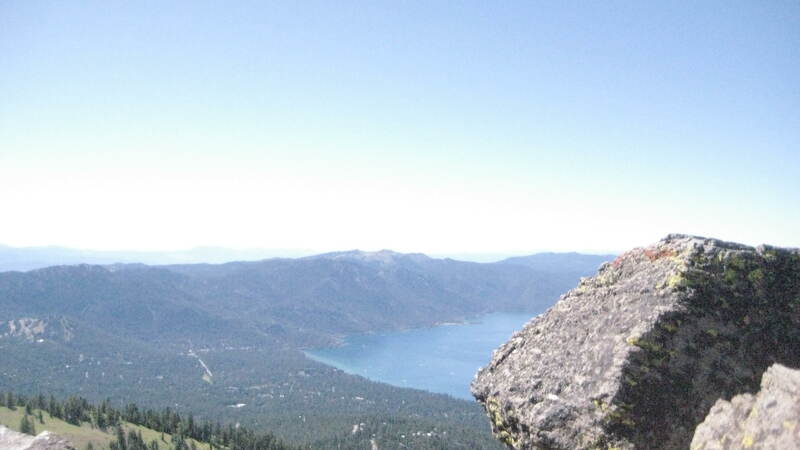 Located in Incline Village, Diamond Peak not only contains challenging terrain for skiers and snowboarders of all skill levels, but the lake views are spectacular. It also has ticket prices that will bring a smile to anyone’s face – especially a parent’s. Designed with the family in mind, there are a variety of different discount options. For those just learning to ski or snowboard, there is the “beginner lift access” ticket that can be purchased for just $25 and can be used at both of Diamond Peak’s beginner ski lifts. Realizing that many children may not want to hit the slopes alone or have the skill to do so, there is an “interchangeable parent” option, which allows one ticket to be swapped back and forth between mom and dad throughout the day. It has proven wonderful for parents who need to split their time watching children on the slopes and perhaps a younger one back at the lodge. Speaking of little ones, there is also a Child Ski Center for kids ages 3-7. It is separate from the rest of the resort and contains its own powerline lift. As if that weren’t enough, kids 6 years and under ski for free. Just over the rather large hill from Diamond Peak is Mt. Rose Ski Area. Somewhat forgotten since it’s on the eastern slope of the Sierra facing the city of Reno, this resort has panoramic views of both Lake Tahoe and the vast Nevada desert. It, too, is nicely designed for families from both a terrain standpoint and a pricing one. While other resorts on the lake may run upwards of $85 per ticket, adults can get a ski pass for $67 after December 16th. Teenagers, ages 13-17, are $37 and children, 6-12, are just $17. 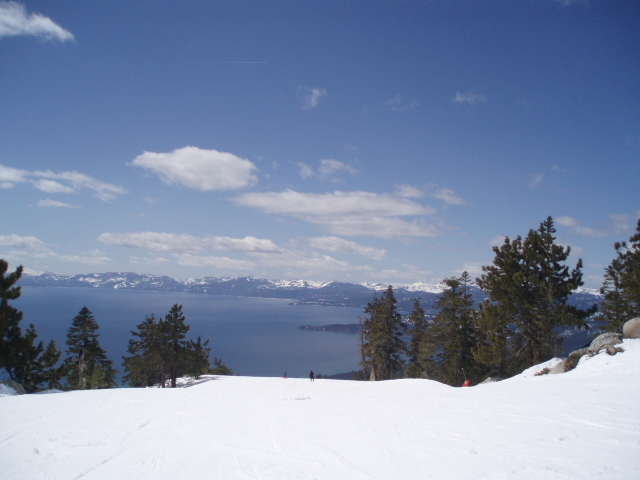 With Tahoe’s highest base elevation and only 25 minutes from both Lake Tahoe to the west and Reno to the east, Mt. Rose is a very nice choice for any family to consider. 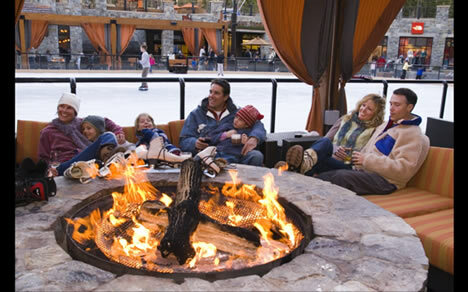 Ticket prices at Northstar-at-Tahoe are definitely higher than other resorts in the area, but with its own rustic village and a plethora of family-friendly restaurants and attractions, including an ice rink, it, too, may be an ideal destination when traveling to the north shore this winter. There is no doubt that skiing and snowboarding is getting expensive these days. Yet, while some resorts offer prices only corporate moguls can afford, thankfully there are others that keep the moguls on the slopes and ticket costs much more affordable. NOTE: All ski resorts offer early and late season discounts, online deals, season passes, and a variety of ski packages that help parents save money. Feel free to contact the ski resorts directly. For more information on local ski resorts or help planning your next ski vacation, please contact us at 1-800-948-7311 or visit us at http://www.goldfishproperties.com. While there isn’t enough snow on the ground for most ski resorts to be open, the cool temperatures, crisp mountain air, and scenic beauty of Lake Tahoe still make it the ideal place for visitors to gobble up a nice vacation rental for Thanksgiving. Just like a savory gravy poured all over the turkey, mashed potatoes, and stuffing, the fact that the area won’t be crowded makes the idea of taking a trip to Tahoe even more enticing. Over the extended four-day weekend, most people will stay at home or travel to a family member’s house because they prefer a familiar, comfortable setting. Having a kitchen one knows very well and room enough for everyone to spread out and enjoy themselves as the eat, drink, play games, and watch football is very important. Although the holiday is one to honor all those that deserve thanks for making our lives better – as the Native Americans did so long ago when the first European settlers came to the New World – it is perfectly designed to bring family and friends together for a few hours of relaxing and bonding. With very affordable rates and spacious accommodations, renting a condominium or house in beautiful Lake Tahoe is also ideally designed for Thanksgiving. There are a plethora of cozy options that come with all the comforts of home – including oversized kitchens for memorable turkey (or tofurkey) feasts and large HD televisions for top-notch football viewing. The fact that it all takes place amid huge pine trees, towering Sierra peaks, and a crystal clear blue backdrop only makes it that much more special. While the lack of snow this November may be disappointing to skiers and snowboarders, Lake Tahoe still remains an ideal place to gobble down a fantastic Thanksgiving feast – along with a memorable family vacation. When it comes to planning a family vacation, most people research and book a reservation at the best, and hopefully least expensive, hotel in and around their respective destination. In the case of Lake Tahoe, however, most travelers are finding condominiums and houses the most accommodating of accommodations. Not only is there a plethora of spacious, top-notch townhouses and single-family homes all within a short walk or drive to the lake, ski resorts, golf courses, shopping, and other points of interest, they usually are much less expensive than a hotel. While a room at the Hyatt Regency in Incline Village may run $150 on a Saturday night during the month of December, a visitor to the north shore can get a very nice 2- or 3-bedroom condominium with two bathrooms and a kitchen for the same price. For those looking to really stretch their dollar this winter, there are condo options for even less, such as two-bedrooms close to the ski resort, Diamond Peak, and other conveniently located options near downtown Incline Village. For those who require smaller places, there are one-bedroom rentals scattered throughout the Tahoe Basin that carry a nightly winter price tag of below $100. Unlike the one-room accommodations at a hotel, condominiums and homes come with multiple rooms, lofts, cots, pull-out couches, and other amenities that make it easier for families to arrange and enjoy their sleeping arrangements. Not to mention multiple bathrooms, possibly a washer and dryer, and a kitchen with cupboards, dishwasher, refrigerator, and other comforts of home. For those with small children who go to bed much earlier than teenagers and older adults, multiple-room places are essential to a good vacation. At a hotel that means purchasing an adjoining room unless there’s an extended stay or special family-oriented resort in the vicinity. 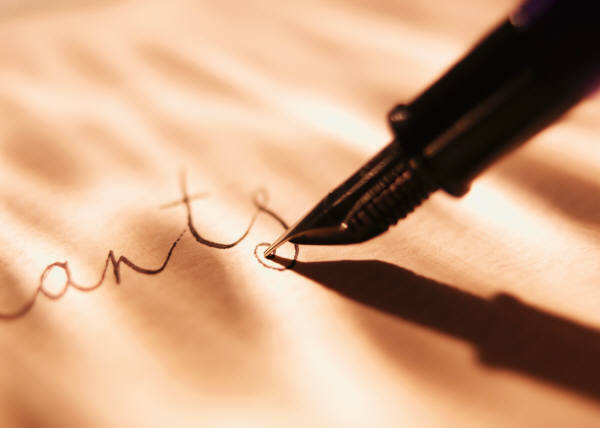 Traveling in large numbers certainly has its advantages when it comes to lowering room costs. Even some of the finest luxury rental homes found near the shores of Lake Tahoe may at first appear to be quite the pretty penny until one realizes how many people the place can comfortably house. One of the featured homes on the Lake Tahoe property management website, Goldfish Properties, costs $1400 per night. At first glance, that seems like a hefty price tag for one night. Yet, upon further investigation, it actually turns out to be a pretty good deal for anybody planning a special occasion where multiple families and friends are getting together. For one, it is a stunning, absolutely gorgeous property just across the street from the lake. It is also a whopping 9,000 square-foot home with a huge outdoor deck, a hot tub, large back yard, a pool table, eight leather recliners, and a home theater system. Oh, and it has six bedrooms and sleeps 22, which brings the price tag down to a respectable $70 per night per person. While hotels definitely have their advantages, such as restaurants, a pool, and a spa on the premises, the outdoor beauty of Lake Tahoe coupled with the economical price tags, really make it the ideal location for most families to go with a condominium or home for their next vacation. With multiple rooms and all the amenities of home, they really are the most accommodating of accommodations. Dinner $100. Bike rental $75. Gambling $150. Shopping $200. Overnight accommodations $300. Vacation in Lake Tahoe priceless. To steal a popular slogan from a credit card company, there really is no price tag one can put on a trip to Lake Tahoe. The expansive shimmering blue lake set amid the towering pine trees and dwarfed by Sierra peaks on all sides is one of the most gorgeous, soul-soothing sites in all the world. Still, if one can save a few dollars on the next trip to the lake, that’s just what he or she will do. To help do just that, there are a few tips to keep in mind when heading to the big sapphire of the Sierra Nevada. Plan an Offseason Trip – While it may not coincide with the summer or winter holiday breaks, heading to Lake Tahoe in the fall or spring will save a lot of money on accommodations alone. Discounts are a plenty, too, when it comes to trips out on the lake, dinner, shopping, and rentals. Take a Hike – Many tourists feel they have to engage in activities that cost money – shopping, boat rentals, bike rentals, tram rides, MS. Dixie or Sierra Cloud trips out on the lake. While all those are fantastic ideas, think about mixing it up with a simple hike. The area is filled with trails – like the Flume, Spooner Loop, and Tahoe Rim – and range from easy to hard in terms of distance and steepness. Plan Ahead – If booked early, not only could there be big savings in terms of accommodations, but the savings in airfare may be enough to offset all other vacation expenses. Southwest Airlines, for example, has great deals into the Reno Airport. Alternative Transportation – Despite the high gas prices, for those that live nearby, piling the family into the car and driving is the most economical way to get to Tahoe. For those that want to try something new – consider taking the bus or the train. Not only is it eco-friendly, but both are economic ways to get to the town of Truckee. It may be a bit slower, but the train as it rumbles through the Sierra into the Tahoe Basin has been known to be quite a scenic, wonderful trip. Condo over Hotel – When it comes to planning a vacation, most automatically start searching for hotels. Since the number of hotels, especially on the north shore, are limited, the prices get fairly expensive fairly fast. With a plethora of beautiful townhouses, condominiums, and full-size homes to choose from, the prices remain relatively low. They also sleep more than one hotel room does, so the bill can be split if need be between family and friends. Also, by renting a home or condo, vacationers can purchase food at the local grocery store and eat in, which also saves precious ducats. Best Bet is No Bet – Since nearly half of the Tahoe area is located in the state of Nevada, there are many locations to spend a little money gambling. Although it can be a very nice social night out, it’s important to remember all odds on every game is stacked in favor of the “house.” Thus, it may be wise to simply stay in for a nice quite evening at home. 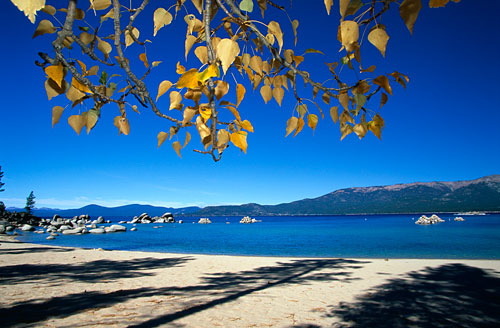 There are many ways to save money when vacationing in Lake Tahoe. The beauty of it all is – it’s free. 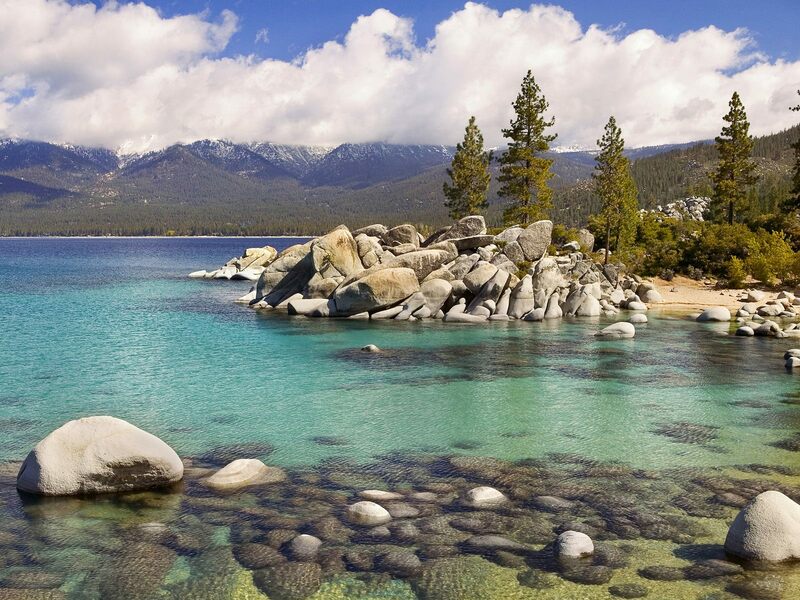 Most go to Lake Tahoe to get closer to Mother Nature and since it’s all around – and free to soak in and enjoy – means the trip will be way more economical than most others. Taking a stroll along the shore, going to the beach, taking a hike, or simply sitting on the back porch sipping coffee or a margarita under a giant sugar pine tree is all gratis. While the scenic beauty of Lake Tahoe and the surrounding area is simply priceless, there are ways to enjoy it at prices less than others. For more information on Lake Tahoe – including popular activities, trail and rental locations, or accommodations, please contact Goldfish Properties at (800) 948-7311 or info@goldfishproperties.com. Feel free to visit us at http://www.goldfishproperties.com as well.